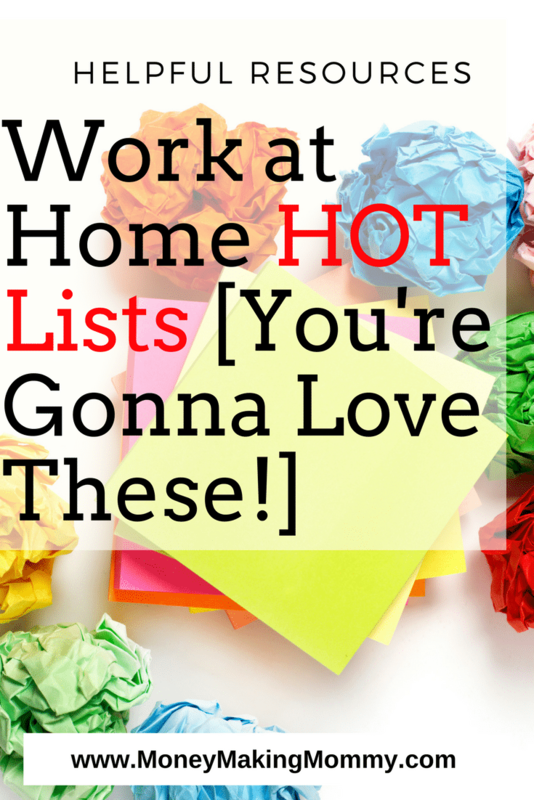 These Lists Make Researching Work at Home and Money Making Fun! Through the years my website has seen a lot of changes. I think it's on it's 6th or 7th redesign since 1999. Not to mention, the site was in HTML code for 11 years and in 2011 I moved the ENTIRE site into WordPress. It was one of the biggest, most frustrating challenges I've gone through as a blogger. BUT – that being said, every redesign and every change I make, my readers become a focal point. Trying to make the site easily navigable so that you can get where you want to go and read about what you want to read about. That's the aim. And I feel like I've got it broke down into manageable bites — but I started thinking because you love the “list articles” so much, why not dedicate a page to them? I mean, makes sense to me! So, a Cool List of Lists! So below you will find all the list sites from MoneyMakingMommy.com. I've got them categorized a little more to try and make it even easier — but I think you'll find it pretty easy to check out what you're most interested in. Because I've been at this for close to 20 years now, I have a pretty good feel for what my readers like. I am hoping, that this page will be another place that readers enjoy and find helpful. As always, with any page I create here — I'm always adding new content. So the page will grow in size. Be sure to bookmark this page so that you can come back easily and check out what's new! – This section will include all posts I've written regarding lists of pay amounts. I'll continually add to this as I write and prepare lists. – I get so many emails from those that have never worked at home or maybe they've never really had a job at all. And they want to know, where to start? Or who hires. This is where I'll include lists/posts that fall here. – Non phone… if I had a nickel for every time someone asked me about non-phone work at home… honey, I could fly to the moon! Seriously though, I get it. Not everyone loves dealing with customers. (I have worked customer service on the phones at home though and I can tell you, it really, really isn't bad!) Here, I'll try to add helpful and fun lists that include non-phone work at home. – Just a place to list where to search for work at home jobs and job leads. – There are always fun, cool and free ways to make money online. These apps and programs and surveys make their way onto my desk and research all the time, so I'm trying to make little lists that make it easier to get to what you specifically want to check out here. What Lists Do You Want to See? Let me know below if there are other ideas for lists you'd like to see. Though I am currently working on several different lists and posts to add, I welcome your thoughts always. I can certainly look at my site analytics and see what people like to view the most — but it's always good to hear from the actual readers! Thanks in advance!